On the plate. Poached eggs with bacon, onion and parmesan on homegrown kale. Irish soda bread on the side. My wife isn’t much for cooking though she does claim the kitchen for baking. However, she is an avid gardener and provider of fresh, organic produce for us. Though I do the bulk of the cooking in our house, she reminded me that our meal collaborations are her supplies and my labour. So it was this past Easter weekend while out in the garden planting potatoes that Andrea harvested a bunch of leeks and some Tuscan black kale that had overwintered. The leeks became potato and leek soup with a recipe courtesy of John Bishop’s Simply Bishop’s cookbook. Interestingly the recipe was a vegetarian one, and although I did use the prescribed vegetable stock, I could not resist rendering some bacon fat to use for sautéing the leeks! You’d be amazed at how many things get bacon when you have a stash of it in the fridge! I saved the kale for breakfast the following morning. My plan was to use it as a bed upon which I would place a couple of poached eggs. Sounds simple, and it is equally that and delicious. I love the slightly nutty flavour and also the texture and structure that cooked kale retains. You can also use spinach for this recipe though I suggest you cook it only just slightly. Note that this recipe is for two people. The measurements are approximate and you can scale as needed. For the poached eggs, bring pan with water and tbsp or so of vinegar to a simmer. Here’s a great tutorial on Rouxbe.com for poaching eggs. Meanwhile in a sautée pan add butter and fry bacon and onions on medium heat until onion is translucent (about 2 minutes). About now, drop your eggs into the other pot with simmering water, then add the kale, and a pinch each of pepper and salt and lemon juice to the pan with the bacon and onions – if it looks a bit dry you can add a splash of water. Stir, cover and lower heat slightly. Monitor both pans. The kale should be ready about the same time as the eggs are soft poached. You’ll have to work out the timing if you want your eggs cooked longer. Take the kale off the heat before it overcooks if your eggs aren’t ready. 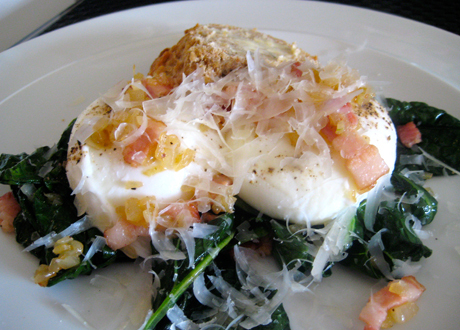 Place kale in center of plate and place eggs on top. Salt and pepper the eggs as you like. Then, scoop out the bits of bacon and onion from the pan and sprinkle onto eggs. Grate parmesan over the top. To further the collaboration, I served Andrea’s home baked Irish soda bread on the side, and fresh coffee of course! A simple, easy and terrific day-starter. This was tossed together so I encourage you to make your own substitutions and embellishments. Make it vegetarian, skip the bacon or use sausage. Grab some duck eggs at the farmer’s market when they are in season (usually April and May), etc. Sometimes the best breakfasts are the ones that come from making do with what’s on hand, either in the pantry or the garden. Tomato poached eggs on truffled polenta cakes /Moose Roast /Pasta Frenzy! This sounds so good! I just got some Himalayan pink salt from Sustainable Sourcing https://secure.sustainablesourcing.com and I think I’ll try it out in this recipe with some garden kale when it comes up! Great post, Ben. Kale is one of those foods that I used to really dislike but have grown to love. I usually sautee it with a bit of chicken stock, and some lemon or white wine. I am on the Island right now and this is truly egg country – drive down any side road and you’ll find someone selling fresh eggs out of their house. It’s amazing what a difference REALLY fresh eggs make, taste-wise. They are much better for poaching, too. Save old eggs for boiling! Thanks for the comments. By far the best eggs I had last year were these XL eggs from flax seed-fed chickens on a farm on Westham Island in Delta we bought on the way home from the Reifel Bird Sanctuary. Those, and also the fresh duck eggs from the East Van Farmer’s market top my list!